ABS motor runs will not stop running with engine off on 2001 Chevy Suburban ? What has happened is the ABS control module has an internal short and constantly running. You need to change the EBCM inside the left frame rail under the driver's door. It's fairly common for this to happen and can be replaced seperate from the module. Here is how to do that. Important: After installation, calibrate the new EBCM to the tire size that is appropriate to the vehicle. Caution: Unless directed otherwise, the ignition and start switch must be in the OFF or LOCK position, and all electrical loads must be OFF before servicing any electrical component. Disconnect the negative battery cable to prevent an electrical spark should a tool or equipment come in contact with an exposed electrical terminal. Failure to follow these precautions may result in personal injury and/or damage to the vehicle or its components. Raise and suitably support the vehicle. Important: The area around the EHCU MUST be free from loose dirt to prevent contamination of disassembled ABS components. Thoroughly wash all contaminants from around the EHCU (1). Disconnect the electrical connectors from the EBCM. Loosen or remove the bolts (4) securing the EHCU mounting bracket (3) to the frame rail (5). Gently move the EHCU down enough to remove the mounting screws that fasten the EBCM (2) to the BPMV (1). Remove the EBCM (2) from the BPMV (1). Removal may require a light amount of force. Important: Do not use a tool to pry the EBCM or the BPMV. Excessive force will damage the EBCM. Clean the BPMV to EBCM mounting surfaces with a clean cloth. • Do not reuse the old mounting screws. Always install new mounting screws with the new EBCM. • Do not use RTV or any other type of sealant on the EBCM gasket or mating surfaces. Install the EBCM (2) on to the BPMV (1). Notice: Use the correct fastener in the correct location. Replacement fasteners must be the correct part number for that application. Fasteners requiring replacement or fasteners requiring the use of thread locking compound or sealant are identified in the service procedure. Do not use paints, lubricants, or corrosion inhibitors on fasteners or fastener joint surfaces unless specified. These coatings affect fastener torque and joint clamping force and may damage the fastener. Use the correct tightening sequence and specifications when installing fasteners in order to avoid damage to parts and systems. Install the new screws in the EBCM (2). Tighten the screws to 5 N·m (39 lb in) in an X-pattern. Install or tighten the EHCU bracket mounting bolts (4). Tighten the EHCU bracket mounting bolts to 25 N·m (18 lb ft). Connect the electrical connectors to the EBCM. Revise the tire calibration using the scan tool Tire Size Calibration function. Labels: ABS motor runs will not stop running with engine off on 2001 Chevy Suburban . This trim can be pushed so the clips will "pop" back into place after the handle repair. The red with blue stripe is the IAT wire and the brown is ground. The terminals are marked 4 and 5 on the connector at the mass air flow sensor. Labels: which two are iat wires on 2007 Toyota Tacoma. both turn signals and hazards not working on Pontiac Sunfire? Your hazard switch is the flasher....It's called a Flasher module. Both the TRN-BU and the STOP-HAZ fuses in the IP junction block supplies battery positive voltage to the flasher module, which is part of the hazard switch assembly. When the turn signal switch is placed in either the left or right position, current flow is from the flasher module's left or right hand output to the turn signal switch assembly. The flasher module then sends an on-off (flashing) voltage to either the left turn signals and their instrument cluster indicator, or the right turn signals and their instrument cluster indicator. The front turn signals are grounded at G102. The rear turn signals are grounded at G304. When the hazard switch is pressed, the hazard switch contacts close and the flasher module is connected to the turn signal lamps. The turn signal/hazard flasher supplies battery positive voltage in an on-off flashing pattern to all the turn signal lamps. All the turn signal lamps and both turn indicators illuminate in the same flashing pattern. 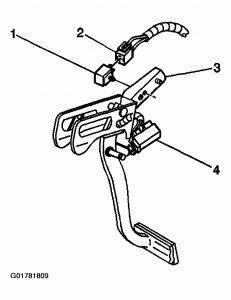 flasher module is #1 in picture below, it is on the brake pedal bracket, below driver side dash . The service manual says the turn/hazard flasher is mounted above the to the right of the brake pedal mounting support. It' under the steering column mounted to something metal on the dash. it has a 5 wire connector on it. the 4 way flashers go through that module as well. turn in the 4 ways and listen for the clicking noise to find where it is. it just pulls out of the connector and push the new module inot the connector. It's a pretty easy job. Flasher is up close to where the steering column mounts to the dash. Does the left signal work? If it does, it isn’t the flasher. Try the hazard lights and get out and look to see if all the lights are working. This way you can tell which is not working, take it apart and check to see if there is power and ground supplied to the bulb. You might have a bulb-socket-wiring problem back to the signal switch in the column. Labels: both turn signals and hazards not working on Pontiac Sunfire. The fuel pressure is low.---------- First thing you can do is get the fuel pressure checked, this will confirm the problem. --------- If the pressure checked low that means problem is with faulty pump and clogged fuel filter. Also another test procedure you can try is, spray starter fluid on the throttle body and see if car starts and runs fine with starter fluid sprayed.Then it indicates fuel pump is faulty.--- Do this test when you face this stalling problem. Labels: car stalls while going down road.